Typical of the southwestern frontier of the US, early settlers in the Dallas area planted Christian congregations representing Methodist, Baptist, and Presbyterian traditions as well as the distinctly American movement, at this point still very new and undifferentiated, that would later become the Christian Church (Disciples of Christ) and the Churches of Christ. 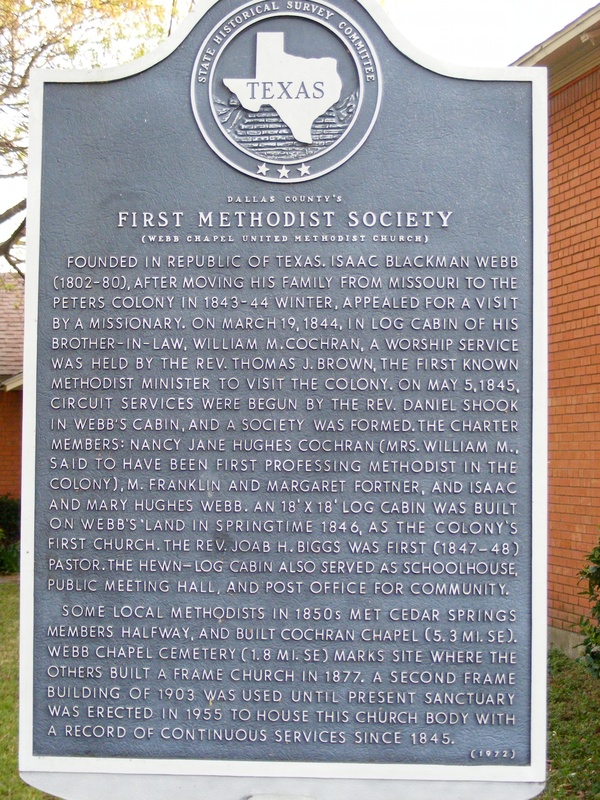 Isaac B. Webb, one of the earliest settlers on Farmers Branch, organized a Methodist society in January, 1844, and the first itinerant Methodist preacher arrived to preach a sermon and conduct formal worship in March of that year. The little society later divided into two groups: one at Webb’s Chapel in Farmers Branch, the other at Cochran Chapel, now on Northwest Highway in Dallas. Webb Chapel Road in Farmers Branch and northern Dallas once connected the Webb and Cochran settlements. By the 1850s there were Methodist societies in Dallas, Duck Creek, and other communities in the area. Farmers Branch also saw the organization of the first Baptist congregation in the area. Peters Colony settlers Thomas and Sarah McAllister Keenan organized a Baptist congregation in their cabin in 1846. Led by Rev. David Myers, it came to be known as the Union Baptist Church. After members of that congregation moved to Carrollton (1870), a remaining group reorganized themselves into a congregation that became the First Baptist Church of Farmers Branch. A Baptist congregation was organized in 1847 in Dallas and originally called itself the First Baptist Church of Dallas, but it later moved to the Pleasant View area in northeast Dallas. The earliest Presbyterian congregations in this area tended to be Cumberland Presbyterians, a group that originated on the US frontier in the early 1800s. Cumberland Presbyterians led by Rev. George L. Blewett settled near the present intersection of Arapaho Road and Grove Road in Richardson in 1853 and established a congregation that eventually became the First Presbyterian Church of Richardson. Presbyterians in Dallas organized a congregation in 1856 that became the First Presbyterian Church of Dallas, aligned not with the Cumberland Presbyterian Church but with the larger Presbyterian Church in the USA. In 1861, the congregation would follow most southern Presbyterians into the PCCSA (Presbyterian Church in the Confederate States of America), later the PCUS (Presbyterian Church in the United States). Lancaster Presbyterians organized a congregation in 1857. Lancaster was also the site of a very early congregation of the Disciples/Church of Christ movement. The earliest Peters Colony settlers to the Lancaster area were led by Elder Roderick Rawlins, who began holding services after settlers arrived in the area in 1844. The congregation would eventually become the First Christian Church of Lancaster. By the 1850s congregations of these four denominational families had been organized throughout Dallas County. A typical pattern in this early period was for various denominational groups to use one church structure, often described as a “union church.” Separate rolls and separate organizations were maintained for each denominational group, and services were scheduled so that, for example, Baptists might use the building on the first and third Sundays of a month, and Methodists on the second and fourth Sundays. In Duck Creek, all of the Christian congregations used the common school building that had been built in the late 1840s as their meeting place. Baptist, Methodist, and Presbyterian denominations in the United States all divided into northern and southern groups in the 1830s and 1840s over the issue of slavery, and the Cumberland Presbyterian Church had been strongly southern from its origins in Tennessee and Kentucky. Congregations of these denominations in the Dallas area reflected the southern branches of each of these traditions. Prior to emancipation, slaves were not permitted to hold meetings by themselves, so enslaved Baptists, Presbyterians, and Methodists participated in Euro-American congregations where they were typically segregated within a church assembly from Euro-American worshipers. Enslaved people sometimes conducted services by themselves informally when they were out of the sight of those who claimed to own them. The late 1850s saw the advent of the first Episcopal congregation in Dallas. Episcopal services were first held in 1856 and in the next year the Church of St. Matthew was formally begun on September 21, the feast day of St. Matthew the Evangelist. The congregation would become the cathedral church for Dallas. Masonic organizations also played a role in the evolving culture of the area. Since their origins in the 1700s, Masonic groups had been purveyors of modern democratic, educational, and economic ideas, and they tended to be associated especially with Presbyterians. Methodists and Baptists in this age were a bit fearful of the worldliness of Presbyterians and Masons, though that rumor did not succeed in keeping Methodist and Baptist men from becoming Masons. The first Masonic lodge was organized in Dallas in 1849. By 1853 they were holding meetings in a frame building constructed on land donated by John Neely Bryan. This group became the Tannehill Lodge, the original society from which other Masonic organizations in the Dallas area grew. Masonic groups contributed to a little ecology of cultural organizations in early Dallas area along with churches and schools. Masonic buildings were often used as locations for schools as well as Christian congregations. The little community of Scyene, about ten miles east and a little south of Dallas, had been founded by early settlers in the 1840s. Masons constructed a building there that was used as a school and as a meeting place for early Methodist and Baptist congregations in the area. Ted, Thank you for your history of Dallas County. In your brief posts, you highlight and interpret the history in insightful ways that allow the reader to grasp Dallas history quickly. This timeline historical information is missing in the Dallas narrative that is accessible online.